In January of this year, through the process of de-amalgamation from Cairns Regional Council, the new Douglas Shire was formed in North Queensland. Residents of the Port Douglas/Mossman area had long protested their forced amalgamation with Cairns and had persisted, for five years, in efforts to regain independence, culminating in a referendum to decide the area's fate. The result gave the shire back its identity as a forward thinking, diverse and scenically beautiful area, poised between the Heritage Listed Daintree Rainforest and Great Barrier Reef. The Arts had long been important to the Douglas community and had been supported by the Shire Council through Queensland's Regional Arts Development Fund, whereby both local and state governments contributed funds to components of arts projects initiated by individuals or groups. Now RADF funding is being offered again to artists and arts groups. So if you have a serious Arts project with which you would like some help, put on your planning hat and apply! You will be asked to describe your project and the reasons behind it. It needs to be viable; an acquittal process is part of the agreement into which you will enter should your application be successful. 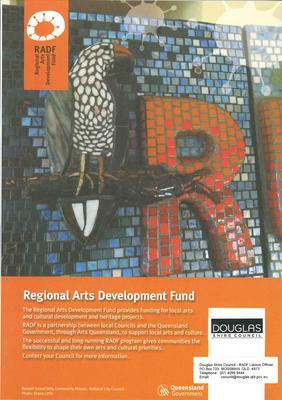 Individuals and groups within the Douglas Shire are invited to apply for up to $1000 under the 2013-14 Regional Arts Development Fund (RADF) for projects commencing after 1 July 2014. RADF is a partnership between the Queensland Government and local councils supporting professional artists living in regional Queensland. Applicants must reside in the Douglas Shire Council area and funded projects must commence only after Council approval has been given. RADF Application kits are available at http://douglas.qld.gov.au/regional-arts-development-fund-radf-now-open/ , or by telephoning the RADF Liaison Officer (Helen) on (07) 4099 9484 or emailing ceounitATdouglas.qld.gov.au. Applicants are strongly recommended to discuss their application with the RADF Liaison Officer prior to lodgement. A RADF Information Session will be held 10am Wednesday 23 April 2014 at Douglas Shire Council 64-66 Front St Mossman. To register your attendance, please contact the RADF Liaison Officer. Please note that RADF applications must be lodged by no later than 4.30pm Friday 9 May 2014. Whether or not you are considering applying for assistance this year or next it would be very helpful if you could complete a survey, available for emailing from the RADF Liaison Officer in relation to the RADF Program for 2014/15 by Tuesday 22 April. This will help greatly in forward planning.